Read it and weep. Dealing with junk mail accounts for 3.5 years of your working life. 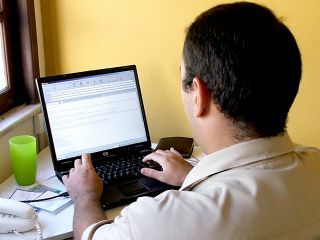 That's the time European workers spend dealing with 'irrelevant' emails, according to new research. The findings are based on the reckoning that managers spend at least two hours per day dealing with email communications. This equates to a staggering ten years of a worker's life spent emailing. The results came from a survey of over 180 senior managers, conducted by the Henley Management College in Oxfordshire. The figure of three and a half years of a working life was arrived at after research found that 32 per cent of messages read and sent are considered irrelevant. The study was commissioned by Bluetooth headset manufacturer Plantronics . It also found that every mail sent usually generates a trail of between four to six additional items popping up in your inbox. The study was, predictably, designed to show that speaking on the phone can "put a stop to the generation of further email traffic, often clarifying issues and speeding up decision making". This is as opposed to email, which often "prolongs the decision-making process". "Our research proves that email use is out of control, often causing confusion and inertia," said Peter Thomson, director of The Future Work Forum at Henley Management College . "It also paints a bleak picture of silent offices where colleagues email rather than talk face-to-face. However there is a solution and it's very simple - make a phone call with a headset and start talking, email should just be used to firm-up and recap on what everyone has agreed on the phone."